Have you watched and enjoyed any of the other Buddies movies? 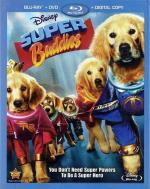 Do you want to watch a kids movie about talking puppies with super powers? Do you want a movie that's family friendly, kid friendly, and super hero themed? If any of that gets a yes, you'll enjoy this film. Are you expecting something besides silly fun? Do you need deep seated angst in your super heroes? If those get a yes, you should skip this movie.